Torques are identical to standard and low pressure spring torques. Female drive spring units are always designed to be mounted between the actuator and the application. Consequently, a female spring designated ‘clockwise’ as a separate module will, when mounted below an actuator, result in a ‘clockwise’ assembly. Female drive springs are not designed to interface directly with modular switch boxes, positioners etc. Female bi-square (star) drive spring fail-safe units are available for models 03 to 20.
e.g. for a standard model 07 actuator with a female star drive, a regular 074-120 code becomes 073F120. See page 52 for full dimensions. Female serrated drive spring fail-safe units are available for models 05, 07, 08, 09 & 10 to give maximum mounting flexibility. Serrated drive units are (excluding couplings) specified by adding an ‘S’ to the ISO/DIN code: e.g. 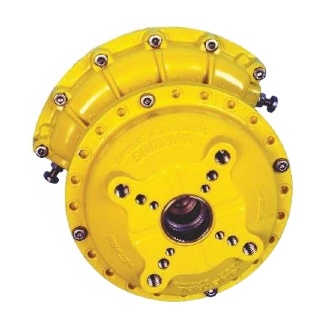 for a standard model 07 actuator with a serrated female drive, a regular 074-120 code becomes 073S120. A range of blank and internally profiled serrated stainless steel couplings are available.